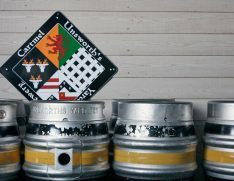 Unsworths Yard Brewery first opened in 2012 by brothers Peter and David Unsworth which is located in the beautiful village of Cartmel. 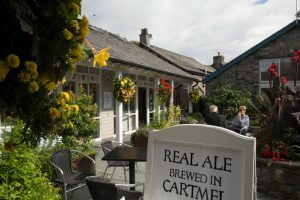 The yard that gives the brewery its name was developed by the brothers from their family’s haulage and garage business which had previously operated on site, opposite Cartmel Priory since 1922. 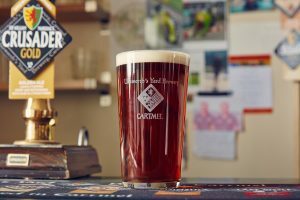 The brewery operates an all – stainless steel plant which produces enough beer to supply casks for house beers, to a number of Cartmel Peninsula pubs. A high proportion of the beer produced is bottled for distribution to a very small and select group of local retailers and restaurants including Green’s. 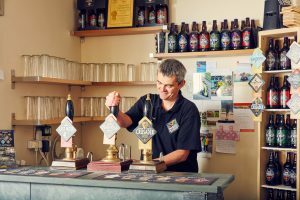 If you would like to sample one of the beers the brewery operates an ‘open – door’ policy which welcomes visitors every day to its small tap room bar where beer can be bought or sampled in full view of the brewery vessels and process. Our social media guru, Holly Goddard contacted Peter from Unsworth’s Yard Brewery to find out more. What made you want to run and start the brewery? How long have you been running the brewery? What is involved in making the perfect beer? What do you enjoy making the beers and running the brewery? Out of all Unsworth's Yard Brewery beers, which one is your favourite? What do you enjoy most about living in Cartmel? You can enjoy Unsworth’s Yard Brewery beers here at Greens which have been paired with some of our most popular dishes off our menu. Choose from ‘Land of Cartmel’, ‘Cartmel Peninsula’, ‘The Last Wolf’, ‘Crusader Gold’ or ‘The Flookburgh Cockler’. We look forward to seeing your pairing on your next visit.